Kevin Fitzpatrick commissioned Nicholas to paint their beautiful Dachshunds, Maggie and Max for his wifes special birthday in 2015. The painting was framed by our local framer Jane in the Traditional Flat frame. The portrait headed over to the US just in time for the family to present it to Kris for her birthday. 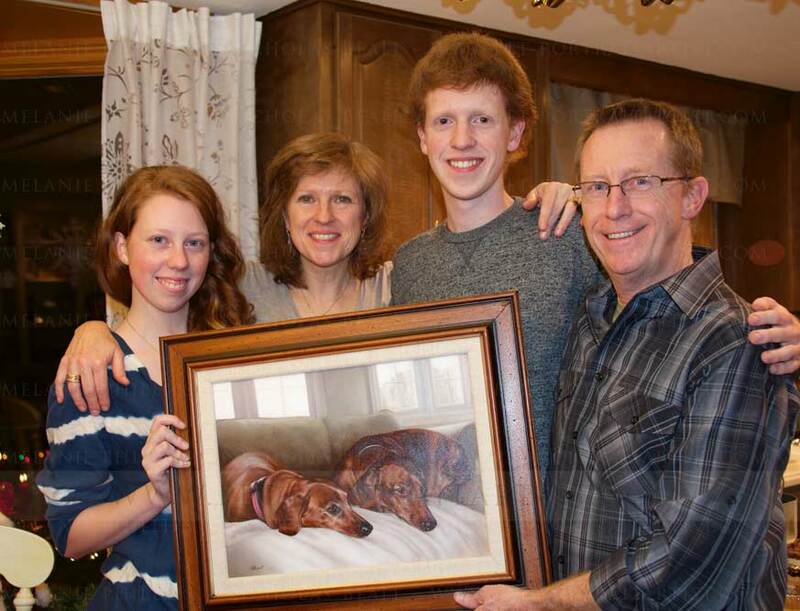 The family had this wonderful photo taken of them on Kris's birthday along with the painting. Kris emailed us the wonderful testimonial below and we are thrilled to be able to add both the photo and the testimonial on our website for everyone to see. It would be impossible to convey to you my complete happiness, awe and gratitude for the truly magnificent painting my husband, Kevin, gave me for my 50th birthday. It not only captures my beloved dachshunds perfectly, but our home as well. Now I know that my dogs will live forever and this time in my life has been captured so beautifully. It's SO beautiful!! I am truly in awe of your talent, Nicholas, and so incredibly grateful to you for doing this work of art for me. I still can't believe it's mine and was made for me. It will be an heirloom for our children as it portrays our home and precious pets so perfectly. Check out the picture showing me and my family on Christmas Eve, my birthday, when I opened this amazing gift.